The union of the vulnerable Cancer and the strong-willed Horse is a harmonious combination that gives its representatives nobility, sensitivity and sincere generosity. Such people are modest, sensitive, dependent on the opinions of others, but at the same time they have enough inner strength to help others. Timid Cancers under the influence of hardy Horses become emotionally stable, gain strength and confidence. True, they retain their own self-care, do not rush to open up to everyone. According to the combined horoscope Cancer-Horse is a balanced, harmoniously developed personality. People of this combination possess self-control and self-control, therefore they are able to restrain the negative manifestations of their character. They give the impression of happy, satisfied people. Such Cancers value their reputation: vulnerable, touchy, painfully experiencing criticism. Although they do not betray their uncertainty: they are cheerful, optimistic about everything that happens. An obstinate, hot Horse is unable to defeat the shyness of Cancer, to make him become more relaxed and free. This representative of the watermark is characterized by indecision, a tendency to self-digging. Even in tandem with the Horse it remains true to itself: it reliably keeps personal secrets and secrets. 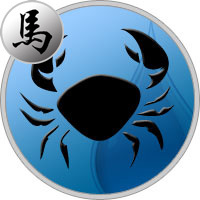 Cancers-Horses are different seclusion, secrecy: they are afraid to get into an unpleasant situation or to hear an unpleasant opinion about themselves. Prefer friendly, non-binding communication, manifest themselves as pleasant interlocutors, but no more. Charming Cancers-Horses can make a good impression and are distinguished by refined manners. They avoid conflicts in every possible way, do not like to quarrel and sort things out. By itself, the Horse is a stubborn and freedom-loving creature, but in union with Cancer it becomes more patient and collected. Therefore, people are drawn to her, looking for sympathy and understanding. The main feature of the sign Cancer Horse is compassion and responsiveness. However, one should not confuse benevolence and softness of Cancers-Horses with weak character and lack of will. They are fully capable of defending their opinions, they will not indulge in other people’s whims and act against their will. Of course, they will manage without quarrels and scandals, but they will definitely do it their own way. Such balanced and calm Cancers-Horses are not really very confident. Subject to mood swings, prone to long reflections, it is difficult for them to make any decision. They are hot-tempered and irritable, in the heat of a quarrel they are able to talk too much. True, they are able to pull themselves together in time, quite successfully cope with panic moods. For the surrounding people, Horses-Cancers are cheerful, sociable people who can support any conversation. There is nothing annoying about them; on the contrary, they draw attention with their benevolent manner of holding on. They have developed eloquence, rich imagination, love to indulge in dreams. However, at the same time they are practical and reasonable, they firmly follow the principle: each person is the creator of his own destiny. In a love relationship, Cancer Horse manifests itself as a gentle, romantic person. Subtly feels his partner, emotionally responds to changes in his mood. Perhaps not too clearly showing his affection, but he is serious about relationships. Cancer-Horse dreams of a strong marriage, not inclined to frivolous relationships. You can fully rely on this person: a firework of feelings does not promise, but it will take care until the end of life. In the first place it is not the visual attractiveness that is put, but the spiritual qualities of the partner. Love horoscope promises Cancers-Horses a prosperous family life. Deeply attached to their loved ones, gentle and caring towards them. He likes to spend time at home, painfully experiences separation from his family, rarely and with great reluctance goes on business trips. Horse-Cancer — an ardent supporter of family traditions, gets great pleasure from a quiet and measured life. He worships his soul mate, does not notice any flaws in it. She devotes a lot of time to raising children, trying for their well-being. A prudent, discreet, zealous Cancer-Horse is a model of an ideal worker. Differs crystal honesty, hard work and responsible approach to business. Whichever field of activity you choose, it will definitely show itself from the best side. It has such a set of qualities that is completely unlimited in its choice. It is easy to find a common language with people: conflict-free, always ready for a compromise. Therefore, it is not surprising that Cancer-Horse has a reputation as a wise and talented leader. Executive, attentive to detail, Cancer-Horse is not afraid of monotonous works. While active Horse tends to freedom, needs frequent changes of activity. Restrained Cancer teaches her perseverance, a serious approach to business. Therefore, people of this combination are able to work in a team, they are not afraid to take responsibility for themselves. They have good organizational skills, are quite lucky as politicians and public figures. In addition, among the Cancer-Horses there are famous athletes, scientists, actors and writers. A sensitive and vulnerable Cancer-Horse man tries to look confident in himself. People like his polite, courteous manners. He tries to control all his words and deeds, but by nature he is quite an emotional person. In addition, uncertain and always doubting himself. Despite his sociability, he often feels the need to leave and hide from everyone. The man Cancer-Horse absolutely is deprived of leader’s ambitions, therefore he chooses work for the soul. But no one can accuse him of laziness, this is a very responsible and hardworking person. In a loving relationship, he manifests himself as a timid partner, willing to make concessions. He will be happy with an authoritative, confident woman who can manage it. Cancer-Horse is a woman full of contradictions, it’s hard to guess her real feelings. This is a sensible person, infinitely devoted to her family. From an early age, she dreams of marrying and finding a reliable protector. At the same time, there is a freedom-loving woman who is able to get involved in dubious adventures. Men like her softness, femininity, but the Cancer-Horse can be stubborn and selfish, even despotic. Therefore, she needs a partner ready to rush to the rescue on the first call, but not limiting freedom. The woman of this combination of signs is a complex personality, but rather predictable if a man can find an approach to her soul. True, one can never be sure of her true feelings, for the inner world of the woman of Cancer-Horse is a great mystery.